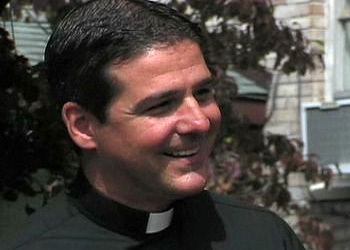 Father Lee Descoteaux was born in Biddeford, Maine. He attended St. Joseph’s Grammar School, Biddeford, Maine, and Biddeford High School, Biddeford, Maine. He received a bachelor’s degree from Lyndon State College, Lyndonville, VT., in 1993 and a master’s degree from Adelphi University, Garden City, N.Y., in 2002. He worked in the admissions office at Adelphi before entering the Seminary of the Immaculate Conception, Huntington, N.Y., in 2002. His pastoral year—2004 to 2005—was spent at St. Joseph parish, Ronkonkoma, N.Y.
Fr. Descoteaux on how God calls. Do I have to be worthy to be a priest?